Pt.s Ordering Food from Outside Hospital? I agree that it can be frustrating to see patients eating food that is counterproductive to their health. At the hospital I work at patients don't order delivery super often, but there is a cookie shop, Wendy's, coffee shop/bakery, gift shop with candy, etc. on site. Plus family quite often brings food in. Really all that we can do as nurses is educate, notify the doctor if the diet order isn't being followed (especially for things such as fluid restriction and renal diet), and ask diabetics to be honest about everything they are eating so that carbs can be accurately covered with insulin. As far as a patient chowing down on food while giving IV pain and nausea meds go....our doctors actually have developed some pretty good protocols for patient populations that typically exhibit those behaviors on my floor (mostly pancreatitis and crohn's flare admits). Typically if they are eating solid foods they are placed on PO pain and nausea meds. This has worked reasonably well. Would you hire an MUSC grad over anyone else? I know of the school b/c I'm originally from South Carolina. No one where I live now would know what I meant if I said MUSC though. 1. Urban Ohio teaching hospital 2. 11 years experience--med surg 3. Base pay=$30.71 4. $5 shift dif from 3pm-7am. Additional $5 weekend dif. $3 charge dif. $3 over-percent dif (for hours 36-40). Double time and a half when working holidays. Cost of living varies widely depending the area of the city one lives in. My husband and I live in a "nicer" area with good schools. We pay around $925 per month for a 2 bedroom townhouse with an attached garage. This is a huge difference from my first 7 years an an RN working in the Carolinas. I got a 13% pay raise when I moved to Ohio! Should Healthcare Professionals Ask About Guns in the Home? This is a crazy long thread, but I just wanted to add my 2 cents in. 1. I'm a gun owner. I grew up in the southeast where guns, bows, hunting, and fishing are a way of life. 2. I would never be offended if a healthcare worker asked me either at my or my child's checkup if guns were secured correctly. 3. Asking about gun safety was routine at the children's hospital I worked at during admission assessment. Right along with car safety, bike safety, water safety, prescription drug/household cleaner safety, etc. Our priority as health care providers is to provide preventive teaching to families. Education isn't always initially welcome (think the 500 lb person who is chugging Coca-Cola all day long being advised to switch to diet soda or the smoker with COPD who is advised to quit smoking, or the end stage liver failure patient who wants to go on the transplant list but needs to stop drinking to do so). Every now and then a parent might be offended that routine household screening questions are being asked....but does that mean we stop screening? I don't think so. 4. Now that I work in adult med-surg we don't routinely screen for gun access as much, but if my patient is suicidal you bet I ask. Especially in a patient with a plan. Bottom line, guns are not evil, but sometimes they are used incorrectly. Ensuring guns are secured correctly in households with children is extremely important. I would respond as a visitor the same way I respond if there is a car accident, someone collapsing at the gym, etc. I would offer first responder CPR/first aid until more advanced help arrived (police/EMS outside the hospital; code team inside). When I'm not clocked in I function in my role as a BLS instructor/provider, not an RN. I wouldn't say start an IV on someone in a car wreck, but I would apply pressure to bleeding wounds, do chest compressions, etc. Same thing as a visitor in the hospital. Hope this helps! 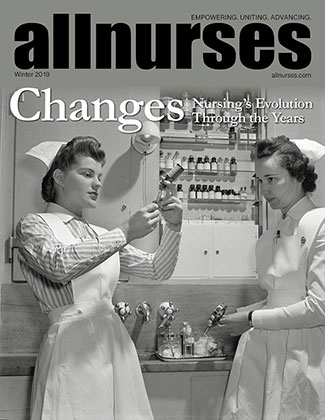 Is your clinical coordinator a RN or advance practice nurse? I'm a bit confused because in your story she seems to be suggesting a plan of care/new orders to the family which isn't really in a nurse's scope of practice, especially since she wasn't collaborating with the physician when she did so. We have a clinical coordinator on the med-surg unit I work on as well (and I feel that that role has been a great addition to our unit). However, our coordinator rounds *with* physicians, works to increase communication between patients/families and the physician, coordinates care with consulting services, PT/OT/social work/case management, and makes follow-up phone calls when patients are discharged. Our coordinator definitely never acts divisively like the story you told in your post. I'm also a bit confused as to the goals of care. You mentioned that the family didn't want "comfort measures" but in an elderly patient with respiratory congestion (I would be concerned about declining respiratory function), increasing narcotics seems like it would be harmful to the patient *unless* a comfort care only approach was taken. Even then, I've never seen a PCA pump used in a confused patient. What I have done is give Q 1 hour Morphine to a DNR-comfort care patient, along with an agent to dry secretions and anti-anxiety medications. Contrary to the beliefs of some managers, families generally *do* notice when staff RNs genuinely care about their patient, perform basic comfort measures such as oral care/turning/etc., advocate for them, and work together with the physician and other disciplines. Trying to boost nurse scores on surveys by bad mouthing the physician is never a good idea and erodes any teamwork which may be occurring on the unit. Surveys are a tool, but stories like this one which portray patient satisfaction as a goal above all others make me worried for the future of nursing. Thank you *so* much for linking the medical mistakes thread. I have been solid laughing for 15 minutes now. I had no idea so many miracles happen around us, every day! If you are only 2 weeks into your orientation, then as a new grad (ideally) you should still be receiving quite a lot of support and assistance from your preceptor. Do you have a consistent preceptor that you feel comfortable talking to? Are you receiving feedback? Does your nurse educator meet with you to ask how things are going and what you are learning? I've been a nurse for 11 years, and have been precepting for about 8 of them. I want to say first of all that being nervous is completely normal. I still remember being absolutely terrified when I started my first job (on a very busy post-op unit whose patients had tubes coming out of every bodily orifice). I actually worry if my orientee has an apparent complete lack of nerves or doesn't call me with questions and/or to come check that they "set an infusion up right" before starting it. I tend to follow those orientees a bit closer, go in behind them in rooms to check their work, etc. because it is *normal* to want your preceptor to check after you for the first 2-3 weeks. Its normal to ask her questions your entire orientation (which will ideally be at least 10 weeks). It's normal to still have questions after you finish orientation (especially during the first 6 months). Being a nurse is serious business, and even now, even after 11 years, I triple check my work and bounce questions off my co-workers if I am doing something I haven't done in a while. That said, your confidence should slowly increase over the next few weeks. If, after the half way point of your orientation you are still feeling mind-numbing fear, talk to your preceptor, and/or talk to your nurse educator. In the meantime take full advantage of the safety features that are in place for med administration. Follow your 5 rights to a T, use bar code scanning, guardrails on your IV pumps, 2nd nurse verification for high risk meds, and any other best practice safety checks that your hospital uses. We are all human, and those features are in place to protect us and the patients. Best of luck!! Your post title made me *giggle*. What exactly are you and the family charging? The exit...the new snack machine...the cafeteria before all the coffee is gone?